"MUSIK" is a 50-minute, one-woman show with an outrageous book by Jonathan Harvey and six songs by Neil Tennant and Chris Lowe including four new songs written for this show. It will star multi-award-winning actress Frances Barber reprising her role as Billie Trix from the 2001 musical, "Closer to Heaven". "MUSIK" will run from 5 to 24 August at Assembly Rooms (Bijou venue), 54 George Street, Edinburgh, EH2 2LR, at 9.40 pm. Tickets are now on sale from the link below or from the box office (phone 0131-226-0000). This year's edition of "Annually", packaged with the four-track CD, "Agenda", is officially published this Friday, April 12th, and is being shipped this week. (Please note delivery dates will therefore vary depending on local post services.) Copies can still be ordered from the link below. Pet Shop Boys release today “The forgotten child", the fourth and final song from their “Agenda” EP which is now available to stream, download or watch as lyric videos on YouTube from the links below. “What are we going to do about the rich? ", described by Neil as "a sort of mock-protest song", is the third new song this week from Pet Shop Boys' upcoming “Agenda” EP, and is available now. 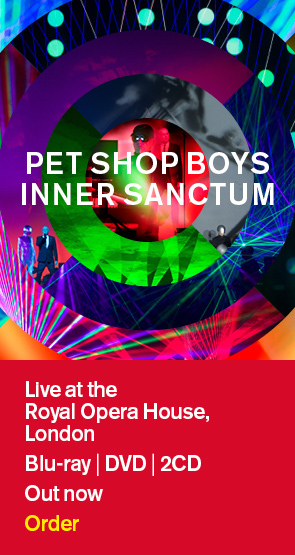 Pet Shop Boys’ new song “On social media” is available now on streaming platforms. It is the second track from PSB’s upcoming “Agenda” EP, which is to be released digitally this Friday.